The parents of U.S. student Otto Warmbier have opened up about the extremely distressing state in which their son was returned to them by the government of North Korea in June. He died several days later. Fred Warmbier revealed in a "Fox & Friends" interview that the first time they saw their son on the plane when he was flown back from North Korea, he "was jerking violently, making these inhuman," "howling" sounds. It sent Cindy, Otto's mother, and Greta, his sister, running off the plane. 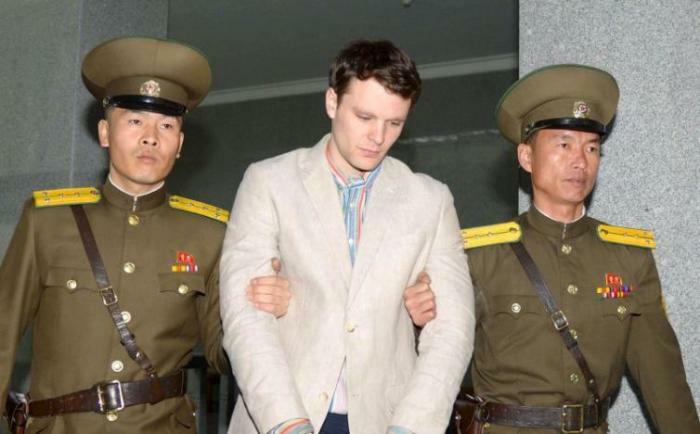 The 22-year-old University of Virginia student was held by the regime of Kim Jong Un for over 17 months, allegedly for trying to steal a sign featuring former dictator Kim Jong Il. The Ohio native had originally traveled to North Korea as part of a tour offered by a Chinese company in 2015, and was convicted and sentenced to 15 years in prison in March 2016. The student reportedly fell into a coma shortly after that, though North Korean officials denied accusations that they had tortured him. Warmbier died days after returning home to Cincinnati in June, with doctors explaining that he had suffered severe brain damage. His parents asserted in the latest interview that their son had most surely been tortured, noting that he was returned to them "blind and deaf, with mangled teeth, jerking violently and moaning on a stretcher with a feeding tube coming out of his nose." Fred Warmbier detailed, "Otto had a shaved head, he had a feeding tube coming out of his nose, he was staring blankly into space, jerking violently." "He was blind. He was deaf. As we looked at him and tried to comfort him it looked like someone had taken a pair of pliers and rearranged his bottom teeth. ... He had a large scar on his right foot." The mother asserted, "They destroyed him." Fred Warmbier hit back against North Korea's claims that it had treated his son according to domestic and international standards, and called on the U.S. government to list it as a state sponsor of terror. "We see North Korea claiming to be a victim and the world is picking on them, and we're here to tell you North Korea is not a victim. They are terrorists. They kidnapped Otto, they tortured him, [and] they intentionally injured him," he said. "It was astounding to Cindy and I to discover that North Korea is not listed as a state sponsor of terror. We owe it to the world to list North Korea as a state sponsor of terror." Warmbier has thanked President Donald Trump for his assistance in getting his son home. "It was a really nice conversation. It was kind. It was, 'Are you taking care of yourself? We worked hard and I am sorry this is the outcome,'" the father shared in June of his phone conversation with Trump. "He told me a little bit about how Secretary [Rex] Tillerson and Joe Yun teamed up and they made things happen," he continued. "He was very candid and it was a nice conversation. To be honest with you, I had avoided conversations with him because they were to what end. I am dealing with my son. This is about Otto. I did take the call and it was gracious, it was nice and felt good and I thank him for that." Trump responded to the "Fox and Friends" interview by tweeting on Tuesday: "Otto was tortured beyond belief by North Korea." During a press conference last year, Warmbier said the Obama administration told him and his wife to stay quiet about their son being held captive so that they wouldn't "offend" North Koreans. Warmbier explained that when his son was first detained by North Korea in 2015, he and his wife were advised by the "past administration to take a low profile while they worked to obtain his release." "We did so without resolve," he explained. "... Cindy and I decided that the time for strategic patience was over. We made a few media appearances and traveled to Washington to meet with Ambassador Joe Yun at the State Department," Warmbier said. "It is my understanding that Ambassador Yun and his team, at the direction of the President [Donald Trump], progressively pursued resolution of the situation. They have our thanks for bringing Otto home."